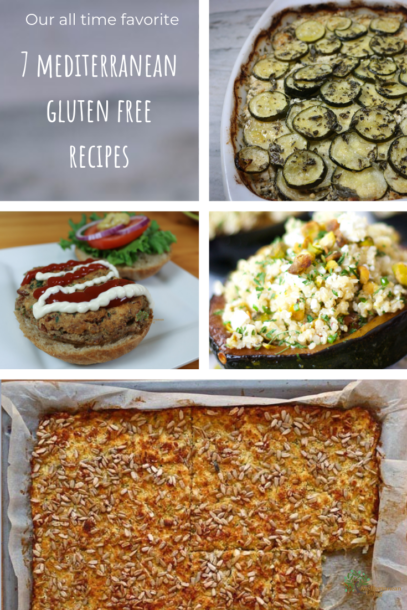 Not being able to eat gluten can be frustrating, but there are so many delicious healthy gluten free recipe alternatives that make eating a gluten free Mediterranean diet much smoother. There are some great alternatives like quinoa and cornmeal that go great with Mediterranean flavors so you won’t even miss the gluten. 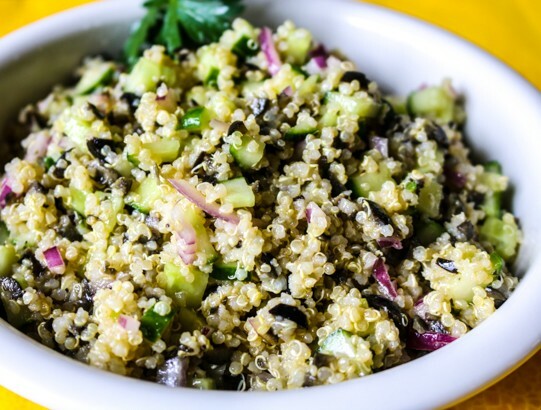 Try the Quinoa Salad with Cucumbers and Olives, which is also anti-inflammatory. It has a really tangy flavor from the vinegar, lemon juice, and dijon, with a nice crunch from the cucumbers. 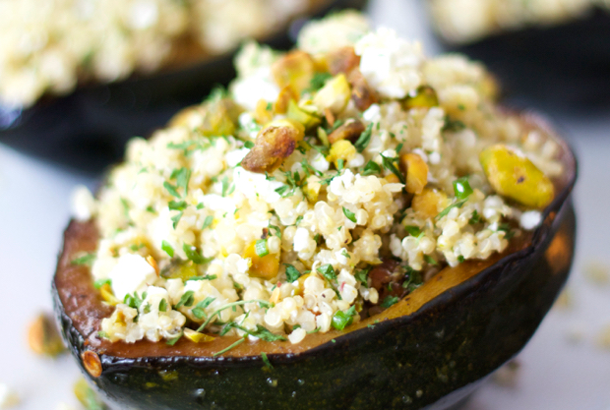 If you want more of a main dish, try the Quinoa, Feta, and Pistachio-Stuffed Acorn Squash. If you’re entertaining a guest who is gluten free this dish will wow them with the presentation! Zucchini casseroles and pies are gluten-free comfort foods that I can’t get enough of. These first two recipes are especially delicious when zucchini is fresh in the summer. The first recipe is from famous Greek cookbook author, Aglaia Kremezi. It uses oats as a gluten-free alternative to add body to this zucchini pie. 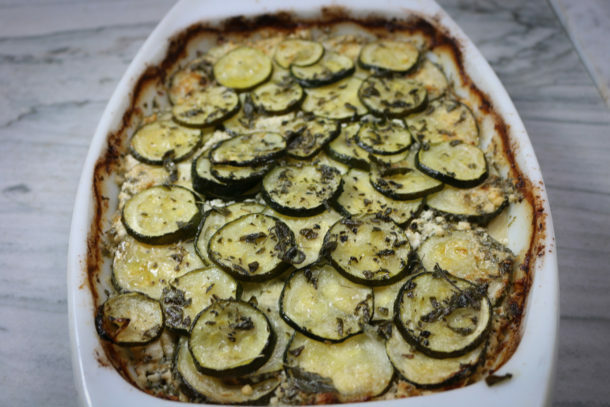 The second zucchini dish is a traditional dish from the island of Crete, which layers potatoes, zucchini, cheese, herbs, and olive oil to create a mouthwatering casserole. Everyone in Crete has their own version of this recipe, and our very own tech guru, Gerry LeBlanc, has developed his own version using not only zucchini and potatoes, but also acorn squash. 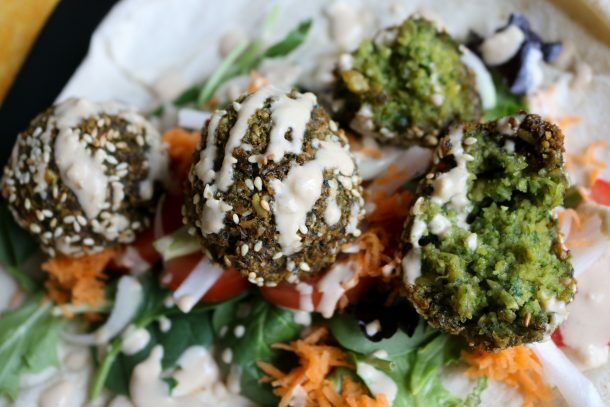 Did you know that most falafel is gluten free? It’s kind of hard to tell because of how crispy and bready it can taste. This method of grinding up dry beans, usually chickpeas with herbs and spices and then frying in extra virgin olive oil is a treat for people who are gluten free. Bill Bradley’s Bean Burgers with Garlic and Sage is another great example of this. Chickpea flour is used as a gluten free alternative to all-purpose flour. These gluten free burgers are loaded with flavor and lightly fried in olive oil, and then covered in your favorite toppings! You can’t go wrong. I hope you enjoy these recipes and all comments are greatly appreciated! This amazing recipe by Aglaia Kremezi, one of our favorite Greek cookbook authors, uses oats to hold this zucchini pie together. Dill and fresh mint are two herbs that always work great with zucchini. The sunflower seeds on top add a nice crunch! Here is another zucchini pie/casserole that’s gluten-free. This is a traditional recipe from the island of Crete that uses all of the fresh local Cretan ingredients in one dish. Zucchini, potatoes, sage, oregano, mint, parsley, feta, extra virgin olive oil, are all ingredients widely available in Crete. In Crete, a local soft cheese would be used, but this version uses feta, cheddar, and parmesan because the majority of you have access to these cheeses. Polenta, or cornmeal, is a great gluten free alternative. It’s creamy, filling, and is a great base for the beans and greens. This recipe uses swiss chard, but feel free to use whatever greens are available to you. There is an entire CUP of extra virgin olive oil in this recipe which makes the beans and greens extremely healthy and delicious. Whatever you do, don’t skimp on the olive oil! Cook with the same Extra Virgin Olive Oil we use in all of these recipes! Quinoa is high in protein (1 cup of cooked quinoa has more protein than an egg), high in fiber (1 cup gives you about 20% of your daily fiber needs) and is a naturally gluten-free food. Quinoa is also an anti-inflammatory food and fits well into most diets. This recipe gets the full anti-inflammatory seal of approval. Also, because it is low in calories and high in fiber, it is a food that is great if you are trying to lose weight. Bean burgers are super quick and great to make when you don’t know what you are making for lunch or dinner. Just grab the ingredients from the pantry, prepare (10 minutes), fry (10 minutes) and within 20 minutes your are ready to eat. It’s hard to believe falafel is gluten free sometimes, because of how crispy and filling it is. One of my favorite Mediterranean foods because of how delicious it is, but it’s also gluten free, anti-inflammatory, and vegan! A delicious mix of sweet, savory, and salty flavors, this stuffed acorn squash uses quinoa to keep it gluten free. This is an amazing side dish or vegetarian option for the fall, but is delicious year-round. Who says acorn squash can only be enjoyed in the Fall?